We might have been a bit too early for peak foliage in Maine and possible a a week too late in New Hampshire but we caught it at the perfect moment in Vermont. People have been trying to guess when the autumn leaf spectacle will take place but there is really no scientific way of predicting. It can happen anytime between September and November. A warm and wet spring and a mild summer is usually a good mixture for a grand display of color, but even that recipe can fail. You just have to take your chance. There are websites like the “Foliage Network” that track the color, but no one as of yet has been able to predict the best “Leaf Peeping” experience. I say, start up north and work your way south. You’ll find it somewhere. Trees and plants take water from the ground through their roots, and through a process known as photosynthesis, they convert carbon dioxide in the air into oxygen and glucose. We breathe the oxygen and the plants use the glucose for nutrients. As long as we have trees on the planet, we’ll have oxygen to breathe. The chlorophyll in the leaves enables the photosynthesis process. It also gives the leaves their green color. However, photosynthesis requires a lot of light, a full, long day of light. In the autumn, when the days become shorter there isn’t enough available light to perform the photosynthesis and as the process stops, the green chlorophyll disappears. Hiding under the layer of chlorophyll however are red, yellow and orange pigments known as carotenoids, kind of the same pigments we see in carrots. And there you have it, the autumn leaves. The Maple trees of New England show a spectacular color because glucose gets trapped in the leaves after the photosynthesis stops. 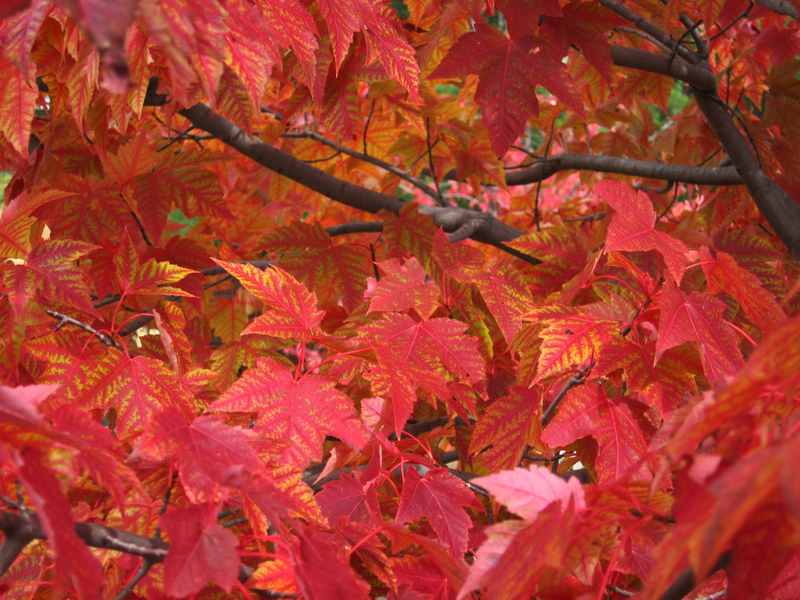 When the chlorophyll dissipates, the red and orange carotenoid pigments are pretty magnificent. Manchester, Vermont is in the Green Mountains. This town goes back to 1764. 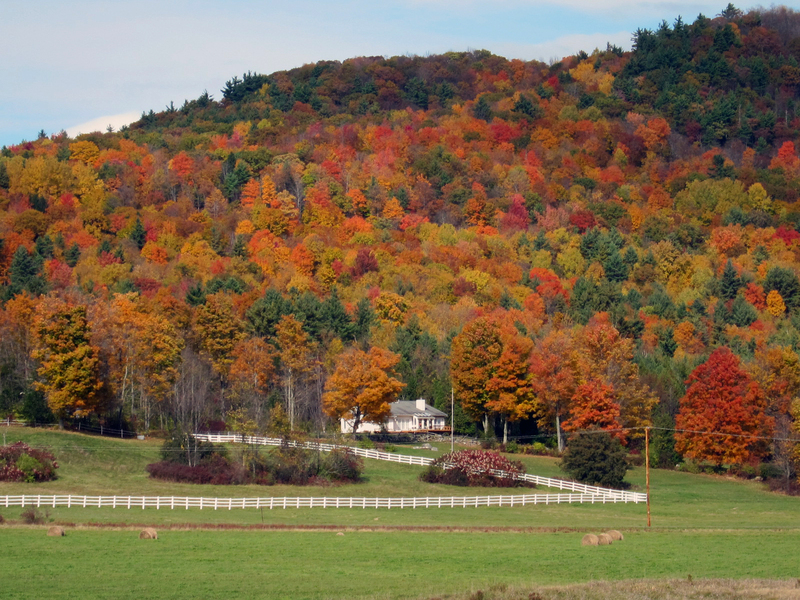 It was recently voted the best place in Vermont to see the autumn leaves. It’s also the best place in Vermont to do your Outlet Mall shopping. Manchester is the home of the largest Designer Outlet Market in New England. Yes, the best prices of the best Designer shops in the world are all right here in Manchester VT. If you’re interested in good bargains, the outlet shops could easily take up a half a day or more. We’re staying at the Equinox Resort in the center of town. This has been an Inn since 1769 and it was a meetinghouse for the fathers of the American Revolution. It’s hosted US Presidents Taft, Grant, Harrison and Theodore Roosevelt. It’s been known as the Marsh Tavern, Thaddeus Munson’s new Inn, widow Black’s Inn, Vanderlip’s Hotel, The Taconic, The Orvis Hotel, The Equinox House and the Equinox Resort. Lucky for us it’s also been renovated since 1769. The most recent renovation was in 2008. There is a beautiful spa, confortable rooms, libraries with welcoming fireplaces, lots of restaurants and bars and great views of the Green Mountains. We’re very content. A short way down the street (to the left) is the home of the Orvis Sporting Center and the Orvis fly fishing school. Charles Orvis, a local fly fisherman, founded the Orvis Company in Manchester in 1856, selling high quality solid wood fishing rods and a sizeable collection of flies. Today the Orvis Company is one of the largest purveyors of sport fishing gear and high-end sport clothing in the country. Down the street (to the right) is the British Falconry School. No one really knows the origin of falconry. Some think the Chinese were hunting with birds of prey since 2000BC while others are convinced the technique goes back further to 10,000BC Middle East. The first recorded use of falconry dates back to about 722BC in the Assyrian court of Sargon II. The English were so particular about falconry; they had laws determining which social class could own which type of hunting bird. The sport has declined over the years and by some estimates, there are now less than 100,000 legally practicing falconers. Half of them live in North America. The British School of Falconry was founded in 1982. It moved to Vermont in 1995 and became the first falconry school in America. The school mostly uses Harris Hawks from southern California because they are relatively easy to train and have a good temperament. Harris hawks weigh about 2-2.5lbs but they can take down an animal twice it’s weight. 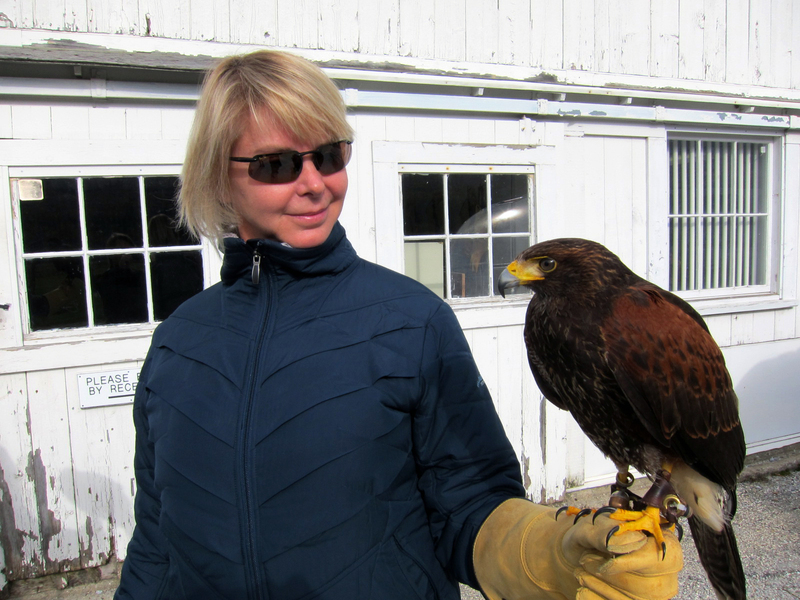 For more experienced falconers, the school also has at least one Golden Eagle that weighs in at a beefy 5lbs. Gretchen’s falcon for the day was a feisty little guy named “Monty” who seemed have his own way of teaching her how to handle him. I opted to be the photographer for the lesson. Just down the road from the Falconry School is “Hildene” the home of Robert Todd Lincoln, the only child of Abraham and mary Todd Lincoln to survive to adulthood. 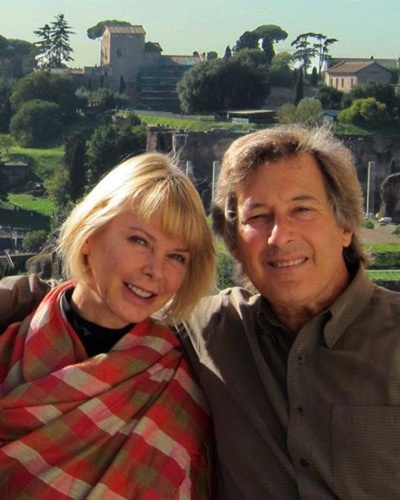 When Robert was the president of the Pullman Company, he built this estate. The Lincoln family lived her for over 70 years. These days it’s been restored as a working farm and Lincoln Museum. Robert Todd Lincoln’s life was saved by by Edwin Booth, the brother of John Wilkes Booth. The young Robert Lincoln would have fallen into the path of on moving train when Edwin Booth grabbed his collar and pulled him back. Sometimes history is rather ironic. About 90 minute away from Manchester, across the border into the Champlain Valley of New York sits Fort Ticonderoga, sometimes known as the first victory of the Revolutionary war. It was taken in 1775 by Benedict Arnold and Ethan Allen. Of course at this point there were only 48 men and women inside the Fort at the time, but nonetheless it was an American victory. The American colonists didn’t have any big guns in these early days of the war and consequently couldn’t really defend the cities. After the victory at Fort Ticonderoga, one Henry Knox, a bookseller in Boston who apparently read one of his books on artillery and realizd that the colonists had neither the tools or the know how to make a cannon suggested to George Washington that the colonists go up to Fort Ticonderoga and “appropriate them”. Knox organized a labor team and took 59 canons and mortors on sleds led by oxen over 300 miles in 56 days before getting back to Boston. The canons were put in place and even through they forgot to bring enough ammunition, the sight of the canons alone saved the city of the Boston from the British. Henry Knox went on to be the first US Secretary of War, but he died at the age of 56 after swallowing a chicken bone that punctured his intestine and caused a fatal infection. The cannons we see at the fort today were all brought in from Europe, where they have a lot of cannons to spare. The fort also played a very large role in the French and Indian War fought between the British and the French from 1754 to 1763 when it was known as the French Fort Carillon. It was called the 7 years war in Europe, although it lasted for 9 years. I have no idea why. The land still evokes the memories James Fennimore Cooper’s “Last of the Mohegans.” The story took place right here at Fort Carillon and the lands around it. When the British finally captured the Fort from the French, Lord Jeffrey Amherst renamed it Fort Ticonderoga from the Mohawk word “Ticonderoga” meaning “place between the waters. Amherst achieved greater dubious honor as the man who offered blankets laced with smallpox to the Ottawa Indians as a gift. It was the first recorded use of biological warfare known in North America. Our last Revolutionary War memorial was in Bennington. 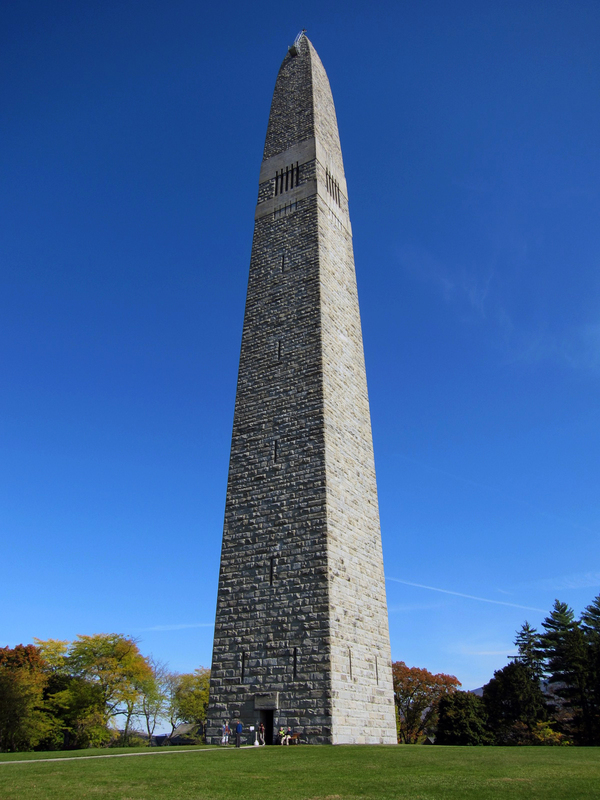 There is a 306 ft tall stone tower here commemorating the 1777 Battle of Bennington, where a group of Continental Army regulars and the Green Mountain Boys of Vermont beat a highly trained platoon of British and Hessian soldiers. The British made a run to Saratoga (now New York) and were eventually defeated. Those in Bennington will tell you that this was the battle that turned the tide of the war to the Colonist’s favor. The Battle of Bennington wasn’t fought on the site of monument. It actually took place miles from here in Hoosick Falls, New York. The stone monument marks the site of the Bennington Depot where the supplies were kept. If the British troops were able to get the supplies, the Battle and possibly the war could have been much different. The monument was completed in 1889 and formally dedicated in 1891 by President Benjamin Harrison. There’s an elevator to the top for those who want the view.